At home, work, leisure, shopping, or wherever you are, you are surrounded by glass. All our lives we have been so accustomed to the problems and dangers inherent in glass that we hardly consider them as problems any more. Now there is a simple, cost effective solution. Hanita Building Films are manufactured to the highest standards, installed to glass with characteristics to improve Safety, Security, Privacy, Comfort, Insulation, Fade reduction and most important of all it improves the appearance of glass QUICKLY, CLEANLY. With so many valuable or even irreplaceable exhibits, a major concern for museums, galleries, stately homes - or commercial display areas and shop-windows - is protection against fading and discolouration caused by Ultra-Violet and infrared light. Hanita optically clear UV protection films filter out almost all of this harmful light, while still allowing clear vision. Supplied virtually clear, or in a range of tints and colours. 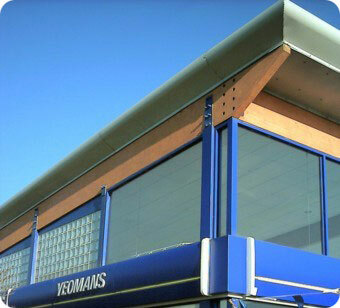 A range of combination films also offers solar and security protection. Applying Hanita optically-clear security film to your glass creates an invisible barrier against bricks, stones and other missiles, protecting people and property, night and day. Now the same material that protects sensitive Government and military installations, banks and commercial premises against terrorist attack can protect your premises from risk of loss and damage. Glare and heat build-up in the summer can make working conditions intolerable. People in offices, schools, and work-places all over the country are affected by the glare from strong sunshine on desks, on walls, and especially across VDU'S, causing headaches and eyestrain. Heat build-up from that same sunlight can lead to drowsiness, loss of concentration and mistakes. In some places privacy is needed, but so is daylight, -office partitions and doors, or bathroom and toilet windows. In other situations one-way vision may be required. Hanitas range of Privacy Films provide solutions to both of these needs simply, economically and without disruption.